Up to now, if you’re traveling by train in Italy all you had to choose from was Trenitalia, the state rail company that used to belong to the Italian state but whose management was privatized a few years ago. Starting at the end of April, travelers started having a new choice for high speed travel between certain cities of Italy called .ITALO. With its dark red color and with Luca di Montezemolo of Ferrari fame being chairman, the train is being called the “Ferrari train”. A cinema carriage, free Wi-Fi acess throughout the train and luxury leather seats add to the high performance, luxury theme…. but the train is intended to be affordable and accessible to all. While Italy has had high-speed trains since the late 1970s, NTV is the country’s first rail operator not run by the state. 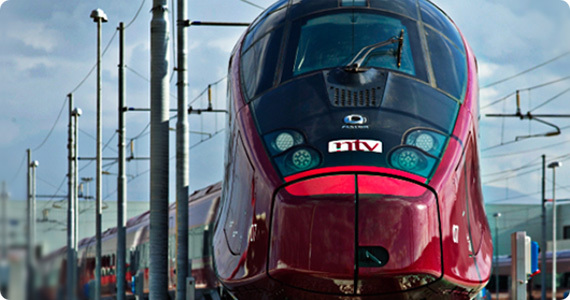 Montezemolo and his consortium of partners (including French state rail company SNCF) have invested €1 billion ($1.2 billion) in NTV, breaking Trenitalia’s monopoly. Trenitalia was ready for Italo’s arrival, spending $100 million upgrading the interiors of its Frecciarossa trains and introducing free Wi-Fi. It welcomes the new high-speed player but is prepared to fight for every customer. How? Both currently have promotional offers running through the summer. Trenitalia’s flexible standard one way tickets from Rome to Milan start from 59 euro and go up to 86 euro ($73-108) whereas flexible standard tickets from Rome to Milan on Italo range from 45 euro to 88 euro ($57-110) (check departing and arrival stations; they are different for the Italo train in both Rome and Milan). Fares can be as low as 30 euros right now with the special promotions being offered with the launch of the new service on the .Italo trains. Italo is currently just going from Naples to Milan passing through Rome, Florence and Bologna. Plans are to add Salerno, Turin, Venice and Padua as stops in the coming months. So as you plan your travels through Italy this summer, take a look at both http://www.trenitalia.com and http://www.italotreno.it to compare rates and find the best offers! In this case, we definitely recommend you try to book ahead of time, as tickets for each of the promotions is limited. Also remember that at train stations, you can buy Italo tickets from the automatic machines, not from the normal ticket offices (which are all Trenitalia’s). Medieval Festival in Monteriggioni this Weekend!